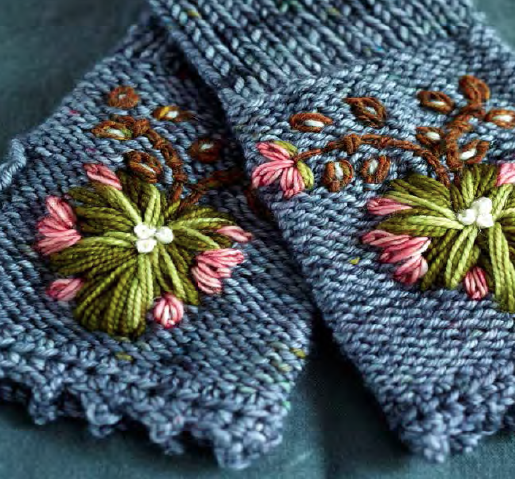 The final design we have to reveal from Loop’s 10 is the Rosemaling Mitts by Tif Fussell (also known as Dottie Angel). 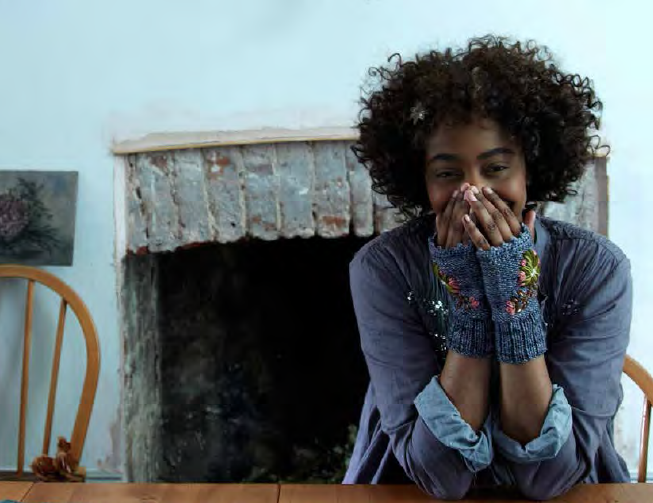 These classic hand warmers are a blank canvas for Tif’s signature ‘woolly tattoo’- pretty floral embroidery that she has taken to adorning her knits and clothing with. A great beginners pattern, finished with an easy crochet edging, the Rosemaling Mitts are also a wonderful way to try your hand at embroidery too. Tif used our custom colour of The Uncommon Thread Lush Worsted ‘Turbillion’ with a Pigeon Roof Mini Skein Set, but you can also use any scrap yarn that you have saved in your stash. Hi Tiff! Tell us a little bit about yourself and your wool based adventures. Woolly Tattoo Blanket. Photo courtesy of Tif Fussell. I appear only to have eyes for yarn these days, this has been greatly helped by working at Tolt Yarn and Wool our LYS where the proprietress, Anna Dianich stocks all manner of lovely yarns and wools which find their way home with me. For now, I am working on creating a collection for small beings, grown~ups and crinklies featuring quality yarns, in crochet and knit whilst adding in a sprinkling of thrifted knitwear with woolly tattoos adorning them. I have also been teaching workshops and classes in recent months and am hopeful next year to be traveling further a field to share my love of woolly tattooing. What inspired the motif that you’ve embroidered on the Rosemaling Mitts? And where did your idea for a ‘woolly tattoo’ come from? I am a squares and rectangles kind of knitter and crocheter, which suited me fine as I wished for the woolly tattoo embroidery to be the star. I am also thinking it is sometimes nice to have a simple knit pattern that a beginner could make but a more advanced knitter could see the potential to change things up a bit. As for the embroidery, I knew it had to be a floral design and I have a lovely wooden platter I found thrifting which has a stunning Rosemaling painting upon it, I took inspiration from an area of the design and then it sort of went on its own merry way. And for folks wondering where the term ‘woolly tattoo’ came from, one day after working on my first pair of embroidered mittens I thought about how we adorn ourselves with tattoos and how it could be if we were to adorn our second skin (our clothing) with woolly ones too. Hence I place the embroidery in areas one might see a real tattoo. A good example would be a thrifted wool coat I found for a bobby bargain and placed a woolly tattoo along the front of where my left thigh which cleverly covered up a blob. 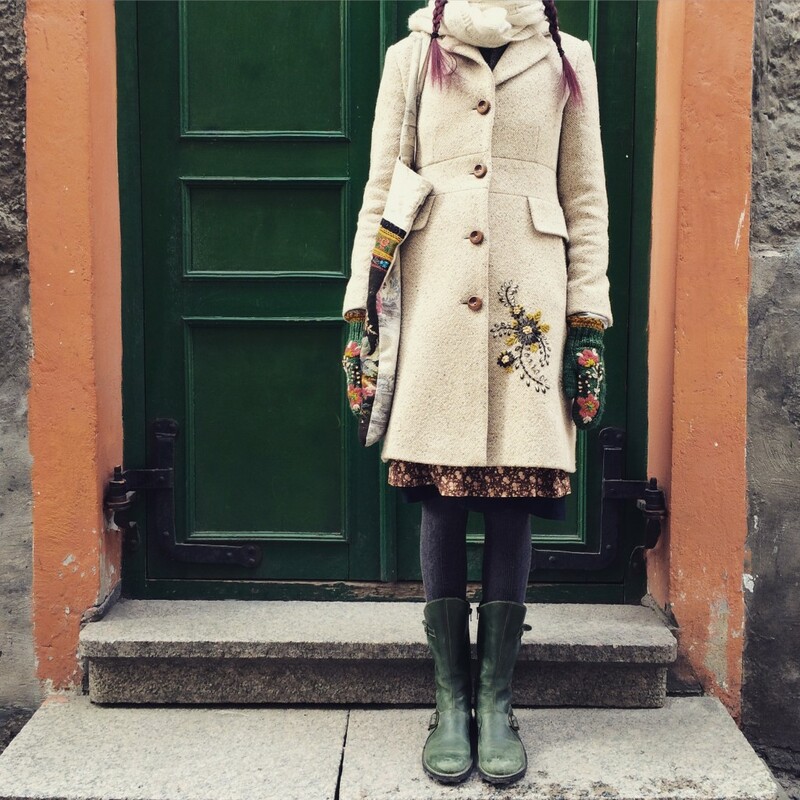 Tif in Estonia with Wooly Tattoo Coat. Photo courtesy of Tif Fussell. Any advice for those trying embroidery for the first time? I must confess the yarns caused me a little bit of practice and patience for I am used to working with thicker yarns and also of late I have found myself working with more rustic fibres. The yarns for the Rosemaling Mitts are beautifully soft and they have a little bit of stretch to them when embroidering. The colour palette took me somewhat out of my comfort zone so I channeled my inner Loopette and it all came together in a most delightful way. For first timers I would suggest you practice stitching on the knitted gauge swatch made for the mitts, before you work on the finished mitts. For once you start stitching into the fabric, there comes a certain point it is not possible to unpick your work. If you are unsure of the stitches, or wish to learn to embroider, try your LYS to see if they have lessons you could take, [Loop is hoping to offer some embroidery lessons with Jessie Chorley this Winter, email the shop to let us know if you are interested and would like more info nearer the time] or go on YouTube for tutorials and indeed, there are a fair few embroidery books out there which will help you on your way. Embroidering on knitted fabric is a little different however to cotton fabric. I do not use an embroidery hoop, I just stitch carefully being sure not to pull my stitches too tight or leave them too loose so as not to distort the knitwear fabric underneath. It is better to build up the layers slowly then to try to do it all in one go. I would also advise when working with mitts or socks or anything in pairs, if you wish the design to be similar on both items then work on them at the same time. Do one bit of the design on one mitt, then do the exact same bit on the other mitt and so forth, this will make all the difference to the finished result. Also, do not fret if its not perfect, the point is you want them to look handmade and you can always add your own flourishing touches to the design if your needle and thread are going off on their own creative path. How did you first hear about Loop and what does the shop mean to you? I have been a Loop and Susan Cropper fan for a long long time. For my 40th birthday me and my soul sister made a pilgrimage to London to see Loop when it was still in its first premises and then several years ago when we spent our first Christmas in the UK since leaving in 2000. Again I took another pilgrimage to Loop in its new premises where upon I met Susan and was a little in awe because hey, Susan for me was at the forefront of turning around the dying LYS situation. Growing up as a child in England, there seemed to be a wool shop in every village and my mother would take me in there, I would look through all the patterns, pick one and we would choose the yarn and then a few weeks later I was wearing a most spiffy knitted number, even in my gothic phase she knitted up oversized mohair black cardigans without blinking an eye. I do not think at the time I realised just how amazing her knitting skills were nor how amazing it was to have yarn stores on every corner. Then it all started to change and slowly but surely they closed down. So to me Loop is a pioneer of a place, it boldly went where others had trodden and failed or dared not tread. It is nothing short of a wonderful inspiring miraculous tale and I am so giddy to be part of Loop’s 10th Anniversary celebrations, I mean truly, how serendipitous is it to think once upon a time I took a trip to London to look at a little yarn shop and all these years on, not only do I get to be part of their birthday celebrations, but to also count Susan as a friend. Loop ticks all the boxes in what a yarn shop is for me, it is colourful, it is filled with exquisite yarns, it has an amazing array of knick knacks I did not know I needed until I saw them all lined up in pretty jars, it has a wonderful scattering of mid century furniture amongst it all and of course it has a lovely line up of knowledgeable Loopettes to guide you in your yarn choices. 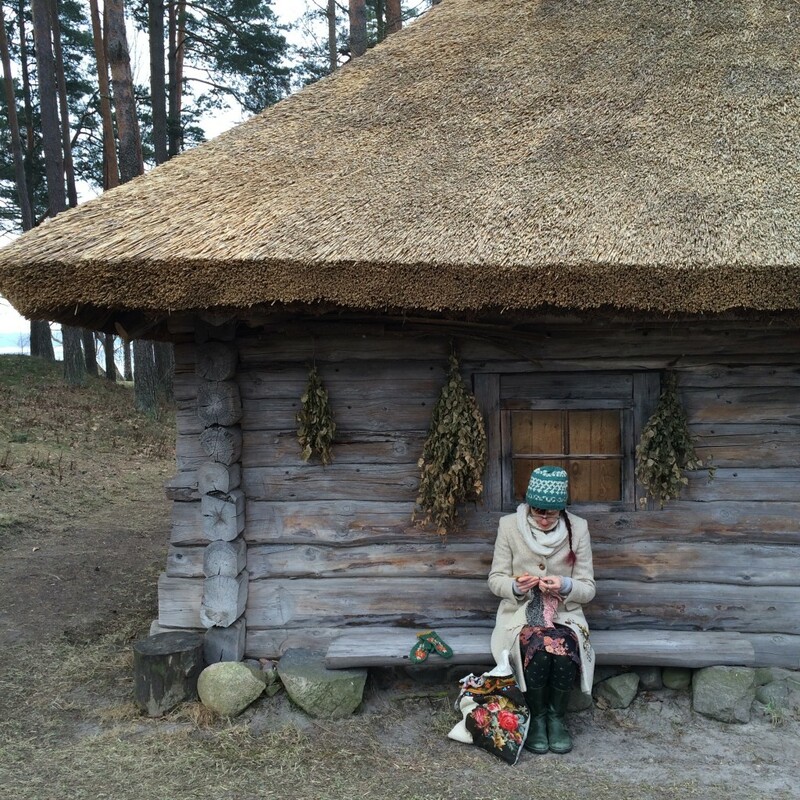 When I was there visiting this spring I bought myself a skein of Madelinetosh in a bright pink, which is ironic because that is US yarn but I had not seen the colour over in my neck of the woods. I claimed that skein for my own and have since used it held with a rustic cream I bought from Estonia to become part of my collection of knits I mentioned earlier. So all in all I am feeling most blessed to be invited to share in Loop’s grand moment and hope one day to stay long enough to teach a woolly tattoo class within its perfecto yarny walls. Now that would be a totally Fan moment for me… Till then, hippity happity 10th birthday Loop! We announced on the blog last week that we are now taking pre-orders for our anniversary book and lots of you are taking advantage of our early birds 10% discount. Place you order here, and please note, if you do order other items in the same transaction the entire order will be held at the shop and only dispatched when the book is available. If you wish to receive your other items sooner, please place two separate orders. Comment on the blog letting us know your favourite shade of Old Maiden Aunt (there are plenty to chose from!) and we will chose one winner at random. This giveaway closes at midnight GMT on Wednesday 12th August and the winners will be notified next week on the blog. Good Luck! Finally, we have the winners of last weeks giveaway to announce. Two skeins of each custom Koigu colour were up for grabs for two readers. And the winners are… chosen at random from the blog it’s Jules who is looking forward to knitting our ‘Islington Shawl’, and from our Instagram account is username ‘salliann’. Congratulations both of you! We’ll be in touch to let you know how you can claim your prize. Happy Knitting, Crocheting and now Embroidering! I love Cinnamon, it reminds me of the colour of a friend’s car back in the 70’s, I always loved that old Mini! Hard to choose, but I love Derelict Daughter. Deep South Fibres will be distributing the book in the U.S.
Blossom Pink is a lovely shade. I can see it in Spring used for a pair of crochet mitts. Can’t wait for the book (pre-ordered) and thank you for the giveaway. Derelict Daughter is my favourite, but they’re all gorgeous. I think for me it’s a toss-up between Bitter Bug and The Angel, Islington. Have so enjoyed the 10th anniversary blog series, and can’t wait for the book! Thank you! As You Wish is a beautiful colour, but they all are! Really enjoy reading all your blog posts! Strange Rock n’ Rollers is my choice! They are all such yummy colours but I would choose’Bluebell’ to remind me that winter dark days will end and glorious spring flowers will surely come. Bluebells always makes me happy, but every one of her colors is simply dreamy. Toasted looks delicious enough to eat! I’m torn between Bean Nighe and Lip Gloss- both are so lovely- but if I had to choose one it would be Lip Gloss as I can imagine knitting a lovely pair of gloves for the autumn with it. My favorite color is Aniseed. Bramble – just right for Autumn! So hard to choose! Seen the Ocean is the color most likely to end up in my knitting basket…if I were forced to make a choice. Such beautiful colours but I think Gothic is my favourite. The Ghillie dhu would be a perfect match for my best friend’s new (and first) home…I would love to knit her up something special! I love Old Maiden Aunt yarn. I have many favorites – Driech and Lon-Dubh to name a few. If I had to pick just one it would be Dreich. Thanks for the giveaway. 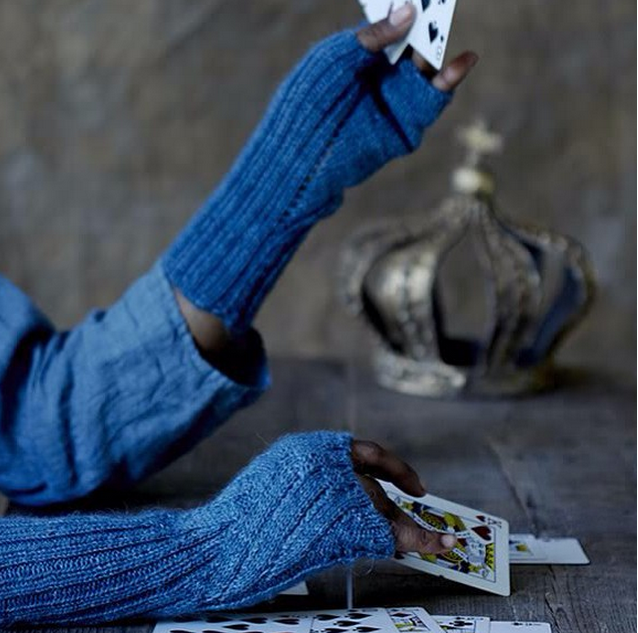 Love Jaded – would look v fetching knitted up as mitts and wearing whilst a cycle commute to work this autumn! So difficult to choose from the lovely colour range, but I have fallen in love with “Jaded”-it reminds me of Caribbean seas. There are such beautiful colours! I absolutely love the jaded colour, but it was hard to choose just one. My current favorite is Cold Sheep. Bluebell is a close second, though. I love the-colour. Cherry lips as it matches my lipstick !! “Ghillie dhu” for me! I love how Old Maiden Aunt’s colours are so wonderfully Scottish. They manage to reflect the colours of the landscape so wonderfully. There’s a line in the Runrig song “Hearts of Olden Glory” – “The colours of Scotland leave you young inside”. And these are the colours! 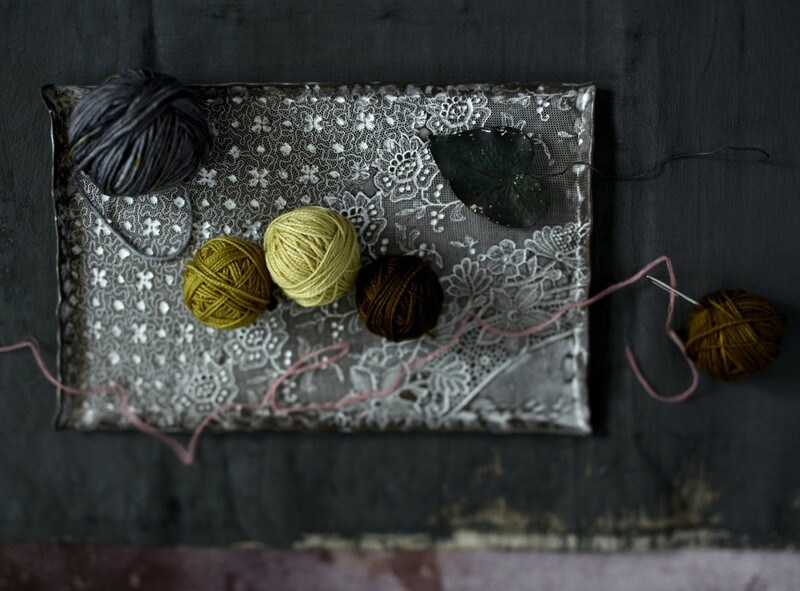 I think greige will be a great canvas for colorful embroidery. Well you’re cruel, aren’t you, Looplondonloves, expecting a person to pick just one colour way of Old Maiden Aunt?! If you insist… :-) I was going to go for Lon-Dubh, it having an Irish name and me being Irish. But in the end I plumped for Derelict Daughter and Dreich held double, so when knitted up that kinda counts as one, right??…. Thanks for the chance to enter the giveaway, great blog, hopefully I’ll make it to your lovely shop in person one day…..
Golly, there really is plenty to choose from! Kelpie is heart-stoppingly beautiful, though. The perfect shade of blue-green-grey. But I am rather taken with the airforce blue of The Angel Islington! Red Velvet. I would like this to knit as it will go well with a coat. Berry good! As is your blog. It’s difficult to choice only one but I would say Gothic is my favourite. My favorite is Dreich, its such a wonderful colour which changes from grey to blue gray depending what time of day it is. I am really looking forward to the book… Lilith’s Angel Islington looks amazing-and it’s where I head for whenever I hit London-can’t imagine why?? Midnight would go beautifully with blue jeans. Looking forward to visiting next week. It’s got to be jaded! My favorite colour is Crazy Ivan with its amazing layers of colours, but there are so many I like! Choose one? That’s almost impossible, but okay, “Put on the day” is my favourite – I can almost never resist orange colours. Aniseed – beautiful warm shade – and the name reminds me of my favourite aniseed ball sweets! Whatever became of them! My favorite is moody followed closely by bitter bug. Absolutely gorgeous yarn! Oooo so many gorgeous colours, and they have such fantastic names too. How to choose just one, I love selkie, midnight and so many more. At a push, I would have to pick Royal, its such a lovely colour. As of now it’s The Angel Islington! All colours are beautiful, but it has to be Last Night’s Red Dress, a fabulous shade and a name that conjures up so many images….. Put on the day is my favourite colour. The Angel Islington looks wonderful. Last Night’s Red Dress…love the color AND the name! It has to be Red Velvet – it’s like finally finding that elusive red lipstick that suits you perfectly! Gorgeous, gorgeous shades! My favorite is Bean Nighe, but just because I’m in a green moment. I love them all. Thank you for this lovely blog posts about the 10th anniversary and the beautiful inspiring pics. Jaded! Frankly this is the color I always wanted for a hat! Right on my head. Oh my gosh! Hard choice … Lip gloss and Put in the day would be perfect for a hat or a pair of mitts. What beautiful colors! So hard to choose just one, but Kelpie is, I think, my favorite. Tied closely with The Angel. It’s so hard to choose, but I think I will go for ‘Bluebells’. I so badly want to try this yarn, am crossing everything. I love all of Lilith’s amazing yarns as she is a truly gifted dye artist! My first love affair was with the Bramble colourway, with which I knitted my first Ysolda Ishbel. Oh! Such lovely colors. Today, I would choose Seen the Ocean. Thank you for the glimpse of Tif and for the generous giveaway. There are so many! maybe Kelpie? Kelpie – although not standing out among all the other vibrant colours there is something with the subtle greens… Perfect for a hat. ‘Bitter Bug’ is such a beautiful shade of green-and I love the name, too. Love your kits and patterns. Really enjoyed reading about Tif and her knitted Tattoos, such fun. I put a comment up before the yarn colour question was posted…or I missed it in my excitement about reading a new post. I like Bluebells…but it was a hard choice – so many great colours. I love all the colours, but Still any Rock n Rollers is my favourite name. Darn Auto correct! I meant Strange Rock n Rollers! I’m in love with Bitter bug, what a gorgeous color! Ooh these are so lovely! I can’t wait to visit your store when I come to London in April next year! My favourite colours would be Derelict Daughter and Kelpie – so pleased that I found you on Instagram! Why is it all so tempting! Oh! to be rich!!!! I love Old Maiden Aunt! I had a soft spot for her Firefly collection, and especially the colourway To The Black. It just has to be Brass Taps and Oak! Selkie, I was lucky enough to buy some at this years EYC but all her yarns are lovely. Love pumpkin pie (totally!). Thanks beauties! Love the purpley blue greys in Bluebells…but I would love any of the the purple shades! Hard to choose but I do like Greens Last Gasp best. 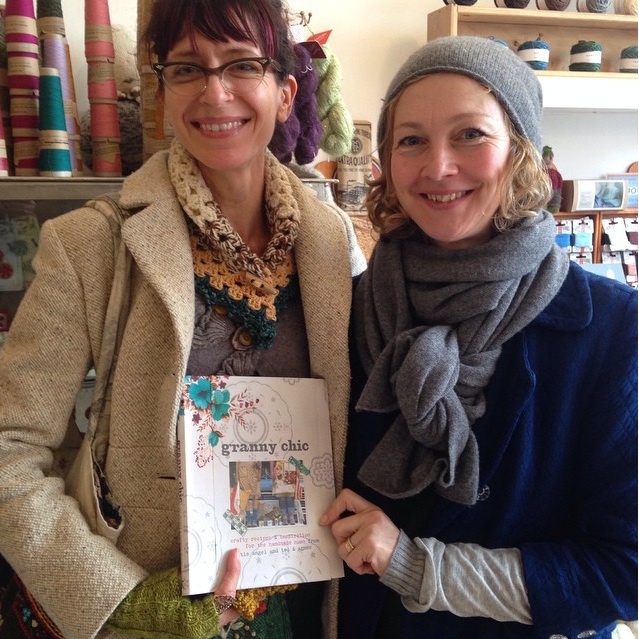 Love the blog and reading the interviews with designers and yarn makers involved in your forthcoming book. My favourite colours are Treacle Toffee and Strange Rock n Rollers. Ooh, spoilt for choice! Fantastic colour range. I think my favourite was Jaded though. Bitter Bug is my favorite! They’re gorgeous, I’ve always been biased towards blue though. Wish I could visit. Toasted it is for me. I love Bitter Bug! I’m looking forward to your book! 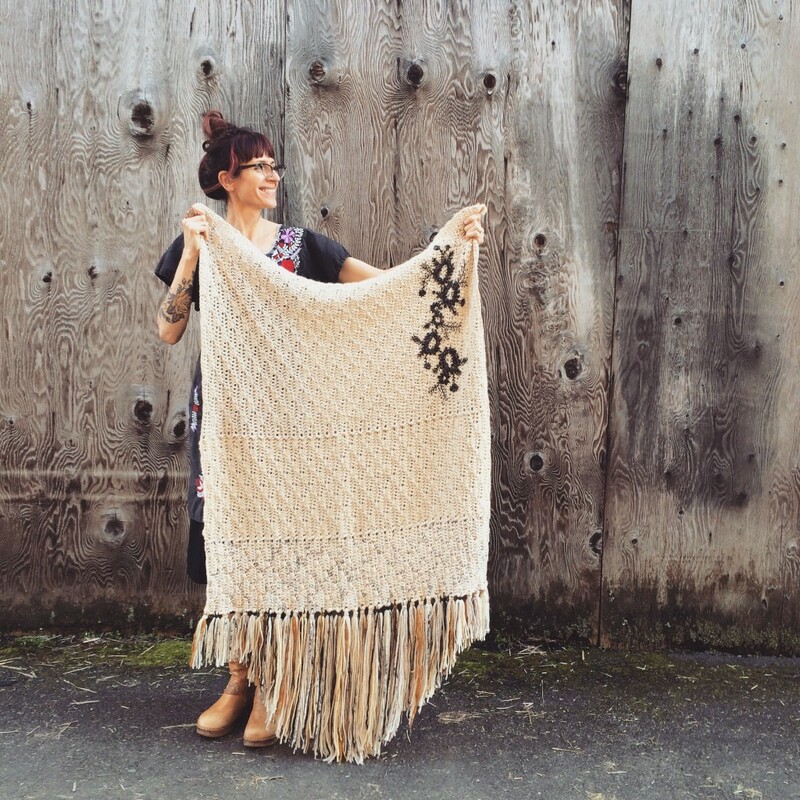 Fingers crossed that I can take a wooly tattoo class from Tif, luckily I live in Seattle! Twu Wuv is the colour for me! It reminds me of the hollyhocks we used to have in the garden when I was a child. so incredibly hard to pick, there are so many beautiful colors. my two favourites are Lon-Dubh (Blackbird)and Kelpie. So many wonderful colours, but I would have to choose “Last Night’s Red Dress” for both the colour and the whimsical name. My favorite color is Jaded. So gorgeously blue! It’s very hard to choose a favourite shade but I think I’d have to go for Dreich. With autumn just around the corner it has to be Pumpkin Pie for me . So many to choose from, but at the moment I love Cold Sheep the most. Gothic is my fav. Thank you for the contest! ooooh, so many to choose from!!! but I’m drawn to Dreich if I really had to choose! Thank you for the chance to try some Old Maiden Aunt! For me it would be Kelpie (so evocative of the sea) and/or lip gloss, which is just so much fun! Both would look great as a beanie for windy,cold days working to walk across the downs in Bristol!